In August 2014, Rachel Kyte penned an editorial in Scientific American on the importance of crop diversity to help our agriculture adapt to climatic changes. News out of Harvard suggests that not only will climate change affect how food is grown, but it will also lower the nutrition levels of what is grown—wheat, corn and rice in particular. While this could be a major cause for concern, scientists know that it is possible to breed new varieties of these staple crops to better tolerate higher levels of carbon dioxide or other climatic challenges. But they cannot do so without an ample supply of plant varieties to work with in their breeding efforts. The perfect example for how adaptive breeding works took place in Thailand in the early 1990s. Cassava—a tuber also known as yucca or manioc that is critical to food security and farmer income—had gained a reputation for eroding and degrading soil at higher altitudes. Economists feared that the bountiful harvests that Thai farmers had reaped in the past were coming to an end. Fast forward to today: Thailand is now the world’s largest exporter of the crop, cornering 70 percent of the dried cassava market and 90 percent of the cassava starch market. Thailand’s problem was solved with an answer that came from the other side of the world. Scientists from the International Center for Tropical Agriculture (CIAT, its acronym in Spanish) in Colombia worked with Kasetsart University in Thailand to crossbreed the nation’s most popular variety of cassava with samples collected back in 1967 in Venezuela. The new cassava can better adapt to a wider variety of growing conditions, has less of an impact on soil quality, and provides a higher starch content that increases the productivity of each plant. The results have boosted crop yields, and Thai farmers are now earning more income from cassava than farmers in any other country. When scientists collected the Venezuelan cassava, they did not have a precise use for it in mind but understood the importance of collecting as many varieties of one species as possible. With more varieties collected, we have more traits—abilities to withstand extreme temperatures and resistance to disease, pests, and drought—for adapting our crops to new and unforeseen challenges. CIAT, with a wide-ranging collection of important plants, maintains one of more than 1,700 gene banks around the world that safeguard thousands of varieties of seeds, roots and other plant parts. The key here is long-term conservation. CIAT cared for the cassava specimens—ensuring that they remained alive and able to replicate—for more than 20 years before providing samples for Thai researchers to use. Charged with assuring this long-term conservation, the Global Crop Diversity Trust works with CIAT and ten other related agricultural research institutions, all part of the CGIAR Consortium, to conserve nearly 800,000 samples of food crops in their gene banks so that the success witnessed in Thai cassava fields can be replicated again and again. In addition, the Crop Trust co-manages the Svalbard Global Seed Vault on a remote island in the Article Circle, offering a fail-safe back-up ensuring that plant resources are never lost if conflict, catastrophe, or budget cuts sideline a research storage facility. The Crop Trust, CIAT and the CGIAR Consortium all receive financial support from the CGIAR Fund Council, which is funded by international donors and also the World Bank. In my capacity as World Bank Vice President and Special Envoy on Climate Change, and Chair of the CGIAR Fund Council, I oversee decisions related to the funding of these organizations. The World Bank helped launch the CGIAR research consortium 40 years ago. But the demand for adaptation research has mushroomed as global warming adjusts growing conditions around the world. Wheat, for example, provides nearly a quarter of the calories in the global diet. More than 120,000 traditional types of wheat and twenty closely related wild species have been collected in gene banks, including many from the hot, dry climates that offer a taste of what’s to come. With so many types conserved and available, scientists can find varieties of wheat that resist a chaotic climate and produce greater yield and nutrition. Unfortunately, as climate change and other people-driven environmental degradation transform our world, we’re losing the very biodiversity that has bolstered our food supply. For example, climate scientists project that global warming will increase temperatures and reduce rainfall in many parts of the Andes, not only decreasing agricultural productivity but also changing the plant life that has been the source of so much innovation. The key to facing issues of climate changes, pests, and diseases is maintaining this diversity. We know that biodiversity loss extends all over the world, and in some ways is seen best on the farm. Spain, for example, had 400 varieties of melon in 1970; today there are only 12. Since 1900, India has lost 90 percent of its rice varieties and the U.S. has lost 90 percent of its fruit and vegetable varieties. And while the total number of traditional plant varieties that have disappeared is not known, many can only be found in the seed collections established over the past fifty years. We will need these collections in the coming years. 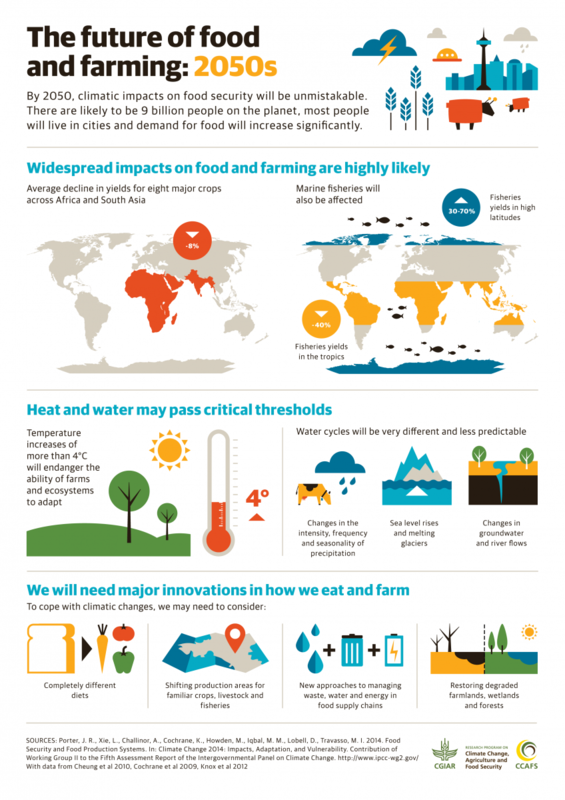 While increasing temperatures are expected to reduce crop yields and nutrition, more and more food will be demanded from a surging global population. Crop diversity is agriculture’s greatest resource for adaptation, the foundation for future efforts to feed the world. As we move into an uncertain, weather-dominated tomorrow, crop researchers need to keep answering new problems—such as the Witches’ Broom disease currently emerging in Southeast Asian cassava fields. Never before has there been a more urgent call to collect and preserve the biological make-up of our global food supply: we need to find these life-saving plants before they go extinct. Crop diversity conservation is the essential building block that underpins all efforts to climate-proof our future agriculture. We need a massive global plant breeding effort, involving both public and private sectors that significantly accelerates the development of productive and adaptable crops. International efforts to collect and conserve crops and their wild relatives must be dramatically increased to feed this effort. Every climate-driven dip in crop production has a price in human life attached to it. About the Author: Rachel Kyte is World Bank Group Vice President and Special Envoy for Climate Change. She oversees work on climate change adaptation, mitigation, climate finance, and disaster risk and resilience across the institutions of the World Bank Group, including IBRD, IDA, IFC and MIGA. Follow on Twitter @rkyte365.